The sheath test system MMG10 is used for the voltage testing of plastic insulated cable jackets. The test evaluated the leakage current in respect to the cable lengths. An adjustable current limiter avoids an eventual drying or unintended change of a fault spot. The high output current can also be used for the low resistive burning of a fault. 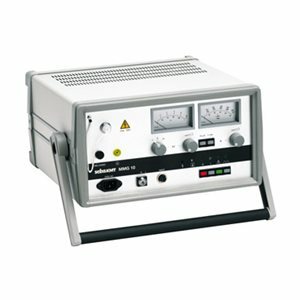 For pinpointing of sheath faults in plastic insulated shielded cables and earth faults in unshielded cables, the MMG10 provides a pulsed output voltage. The pinpointing is done by the step voltage method with the Earth fault locator ESG 80-2 / ESG NT. The MMG10 can also be used as Burn voltage supply for the Arc Reflection Burning with the ETF 3.